Boston 2024 is scheduled to release its next set of bid documents by June 30. The new plan, we are told, will still be designed to avoid the use of public money — except for infrastructural improvement investments that supposedly will be made anyway. Let’s begin by acknowledging that the no new money for infrastructure requires us to overlook over $1 billon in unfunded projects, to depend on accelerating billions of dollars of projects from 2025-2034, and to pretend that there will be no cost overruns and that the post office next to South Station will find a new convenient home and cost nothing to build. Representative Bill Straus, chair of the House Transportation Committee, estimated that the actual infrastructure costs would be $13 billion, or $8 billion above the $5.2 billion presented in the first bid. But the infrastructure budget will have to come from funds appropriated by the Legislature and signed by the governor. The same is true of the venue budget and any subsidies to the operating/security budget. 1. When Peter Ueberroth ran the 1984 Los Angeles Olympics, he refused to take local donations. He was concerned that by doing so there would be less money donated to the area’s nonprofits. In contrast, Boston 2024’s bid boasts of its ability to raise local donations. Local nonprofits will feel the pain. 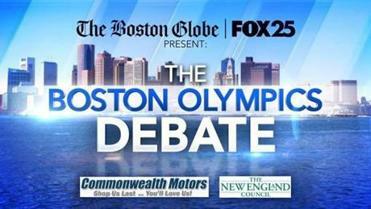 Watch a live analysis featuring Boston Globe columnist Shirley Leung, reporter Mark Arsenault, and Sharman Sacchetti of FOX25. 2. The IOC has a technical manual on brand protection. It requires the host city to clear all advertising space for a month before the Games and several weeks afterward, so it may be used for the Olympic sponsors and the Five Rings. There is not only the expense of taking down and putting back the existing advertising on billboards, busses, trains, and at the airport; there is also the lost ad rental income for two months. 3. Boston 2024’s initial plan stated that 25 percent of the needed land was privately owned. Once purchased for the Olympics, the affected city stands to lose property tax collection on the land. 4. The IOC requires each host to sign an agreement around tax exemptions during the Olympics, usually voiding a variety of sales and other taxes. 5. City workers will have to work overtime. 6. More urgent infrastructure projects will be displaced. 7. Environmental degradation will ensue from the massive construction. 8. There will be opportunity costs associated with the dedication of human time, resources, and land to the Olympic project. 9. There will be operating deficits for permanent venues, such as the velodrome and aquatic center, for years after the games are over. 10. Finally, there’s an unknowable and potentially massive cost associated with the requirement that the city or state provide a financial guarantee to the IOC against any cost overruns or revenue shortfalls. The average cost overrun from the summer Olympics since 1976 is 252 percent, after controlling for inflation. Boston 2024 says that it can buy insurance to protect against this risk. It says it will follow the example of Chicago’s bid for the 2016 Games. In that instance, there was nothing more than a plan to cover up to a $1.4 billion deficit of the operating budget. There was no insurance for shortfalls in the venue or infrastructure budgets. Think about it. If you ran an insurance company, how much would you charge Boston 2024 to insure it against cost overruns of billions of dollars, given that every single Olympic Games since 1960 has had an overrun? Boston 2024 has been pulling the wool over our eyes from day one. The things it doesn’t mention may be as important as the things it does mention.